I was once skeptical of blogs—actually, a little part of me still is. I aspire to retain just enough skepticism so I can keep in touch with the rest of the world. 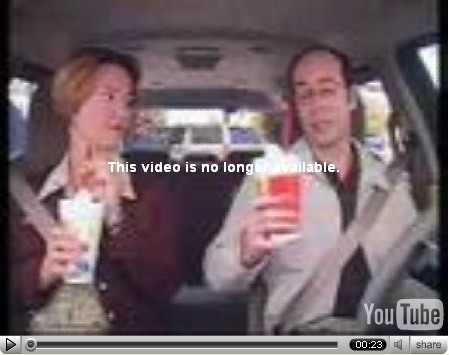 This Sonic commercial about a guy saying he is going to blog about his milkshake experience always makes me laugh. Nevertheless, the bottom line is: if you are passionate about something, blog about it. “Blog” is on the far right of the top navigation menu above because I originally did not intend for the site to have a blog. In fact, at one point I proudly proclaimed (to myself—the site wasn’t live) that the site would not be a blog. In the last few months I decided to add a blog, so I just tacked it onto the end of the top navigation. Can I promise to have a dozen posts a week or month? Perhaps during the holidays during my annual candymaking marathon, but the rest of the year we’ll just have to wait and see. I’ve built this site because I’m a web developer who loves desserts. This isn’t about the pursuit of a technorati ranking or notoriety, but it’s fun to see the stats change. About six years ago some friends half-jokingly suggested I start a business and they would invest in it. I didn’t take them seriously, but just to be safe I thought I should grab a domain and at least park it for a while. For years I did nothing with the domain, but last year I thought I should finally put the website together so I took some pictures while I was making holiday candies. In February, I sat down at the computer and started to design the website—graphics, database schema, html and so on. Nine months after I conceived the site, I’m just about ready to open the doors for…well, not business, but reading and sharing. Welcome to the Chocolate Gourmand! I sincerely hope that all my fans are going to be very interested in my experience of making candies. This entry was posted on Wednesday, November 29th, 2006 at 11:00 pm	and is filed under Candymaking. You can follow any responses to this entry through the RSS 2.0 feed. You can leave a response, or trackback from your own site. Other folks with your passions will connect with you, and you’ll grow as a community. Shared knowledge, new contacts, interaction, and not to mention some rough parts too. Enjoy the journey Chocolate Gourmand!